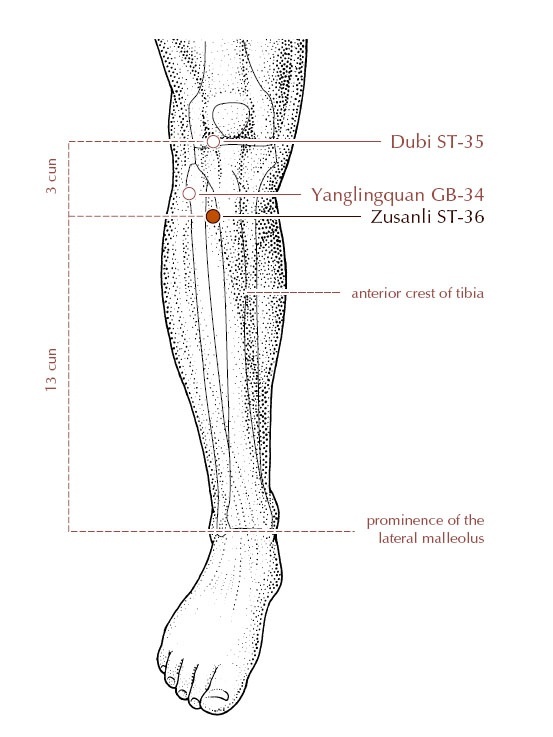 ST36 - One of the most admired and potent of classical acupuncture points because of it’s ability to energize and assist the body to recuperate. It’s often used to boost energy in general, and is particularly useful in strengthening the immune system. In acupuncture lingo, 'ST' references the channel as being related to the stomach organ, and the number refers to it being the 36th point on the channel. It is also called Zu San Li, which roughly translates as Leg Three Miles. As the legend goes, it earned that name as it was used to help soldiers surpass their fatigue and accomplish marching three more miles. It’s also a unique point in the body, as it’s the only one referred to as the Sea of Water and Grain, which references it as a vast reservoir of energy and substance that can be accessed in times of need. According to acupuncture theory, ST36 strengthens the spleen (an important organ that supports the immune system) and strengthens Wei Qi, aka the defensive energy that protects the body from external pathogens. Some recent research shows that using this point stimulates the increase of interferon-γ and interleukin levels in the blood, and enhances the expression level of CD4+ T cells in the spleen. Also, these levels were higher in the acupuncture group compared to both the sham and control groups. Other studies show that using this point also boosts natural killer (NK) cell activity, which are the soldiers that do the work in clearing out infectious microbes and tumor cells in our body. Not only that, but the same research showed that blood serum transfused from the acupuncture group to the non-acupuncture group enhanced the latters’ immune systems as well. Acupuncture serves as an excellent tool in your fight against germs and to ensure a fun and healthy holiday season. For more info, please feel free to contact me by email, or schedule an appointment or free consult. Jpn J Physiol. 1996 Apr;46(2):131-6. Tuning up your immune system, the time is now!